The battery of field artillery that fired the first American shot against the Germans was commanded by a San Antonio officer, Captain Ralph Heard, according to letters received in San Antonio from members of the expeditionary force. A French .75 was the weapon used. Captain Heard is the son of Col. J. W. Heard, of the regular army and was graduated from San Antonio High School with honors in 1915. Prohibition as directed by the 18th Amendment takes effect tonight at midnight. 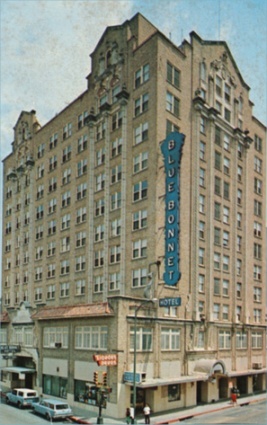 The Bluebonnet Hotel at St. Mary’s and Pecan streets opens for business. Posted on January 16, 2018, in Texana and tagged 1918, 1920, 1928, WWI. Bookmark the permalink. Leave a comment.